Israeli soldiers abducted, overnight and at dawn Tuesday, twenty-four Palestinians, including children and a young woman, during invasions and violent searches of homes in Jerusalem, Hebron, Nablus, Tubas and Ramallah, in the occupied West Bank, the Palestinian Prisoners’ Society has reported. The PPS stated that the soldiers abducted twelve Palestinians, all are civilian guards of the Al-Aqsa Mosque, in occupied Jerusalem, after invading and ransacking their homes in several parts of the city, and later release one of them. The have been identified as Qassem Kamal, Samer Qabbani, Osama Siyam, Salman Abu Mayyala, Luay Abu Sa’ad, Hamza Nimir, Mohannad Edrees, ‘Aahed Jouda, Arafat Najeeb, Khalil Tarhouni and Khaled Sharif. 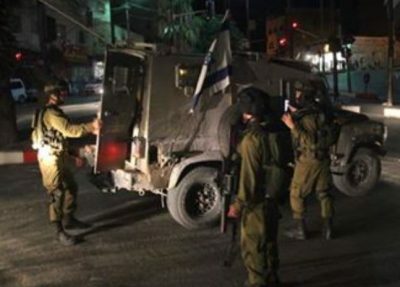 In Hebron, in the southern part of the West Bank, the soldiers abducted Mahmoud Raed Masalma, Ahmad Khaled Abu al-Jammal, 16, Abdul-Rahim Amran al-Atrash, 28, and Abdul-Rahman ‘Ala al-Jabari. In Nablus, in the northern part of the west Bank, the soldiers abducted a young woman, identified as Sojoud As’ad Reehan, in addition to Dirar Sami Thaher, 22, Amir Sweilem, and Ahmad Eid Hindi, 22. In Tubas, in northeastern West Bank, the soldiers also searched homes and abducted a child, identified as Saif Daraghma, in addition to Jamal Rakez Maslamani. In Ramallah, in central West Bank, the soldiers abducted Nasr Adel Barghouthi, 16, Ali Ahmad Barghouthi, 18, and Mohammad Khalil Abu Srour, 18.